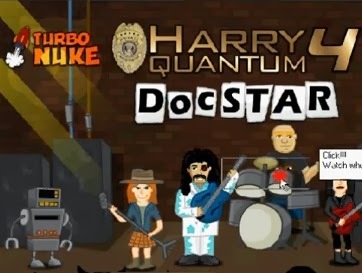 Harry Quantum 4: Docstar is the latest installment in the point and click detective adventure game series of Robotjam. This game uses a simple mechanic of point and click but implements challenging and clever puzzles in it. In this episode, you have to rescue band members held in a castle across the lake where Loch Bess is believed to be living it. You get to play not only as Harry the famous detective but also Graem the robot. Alright, here is my recorded Harry Quantum 4 Docstar walkthrough showing full gameplay and some PIPs being found. Please make a written walkthrough! My computer doesn't allow youtube videos to play. It would be greatly appreciated! Thank You!! !